In 1997, George Ranalli Architect was asked to interpretFrank Lloyd Wright’s thesis for “The Living City” in the form of a three-dimensional hypothetical model for exhibition. The process began with the examination of Wright’s text The Disappearing City (1932), and Broadacre City model, completed in 1935, (the term “broadacre” refers to Wright’s idea for each family home to sit on an acre of land), and the expanded treatise The Living City (1958), and 200 of Wright archival drawings and project documents for built and unrealized architecture. The Living City three-dimensional model, measuring 64-square.-feet, fabricated in four interlocking sections of Birch wood, Basswood, plexiglass, and foam, incorporates Wright’s ideas about a decentralized city, including an integration of his rendered Plans 1-2, and Plans 3-5, and Broadacre City. Interviews with Wright’s apprentices, Bruce Brooks Pfeiffer, and John Rottenbury were also instrumental in the construction of an authentic representation of Wright’s visionary urban master plan. 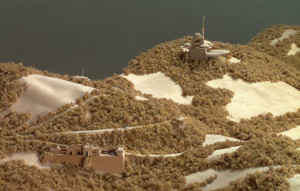 The Living City model is populated with over 150 Frank Lloyd Wright structures of every type – residential, civic, and institutional – and function, such as bridges, stadiums, green spaces, and spiritual communal gatherings places. The model even includes Wright’s striking architecture for utilitarian buildings like gasoline filling-stations, retail stores, and urban agriculture. The Living City includes Frank Lloyd Wright’s recognizable unrealized prototypes for Hunting Hartford Sports Club/ Play Resort , Hollywood Hills, California, 1946-48; Pittsburgh Point Civic Center, Pennsylvania, 1947-48; and Golden Beacon Tower, Chicago, 1956-57, and modern masterpieces, including the Marin County Civic Center, San Rafael, California, 1956-62; Beth Sholom in Elkins Park, Pennsylvania, completed in 1959; and Charles Ennis House, Los Angeles, California, 1923-24. 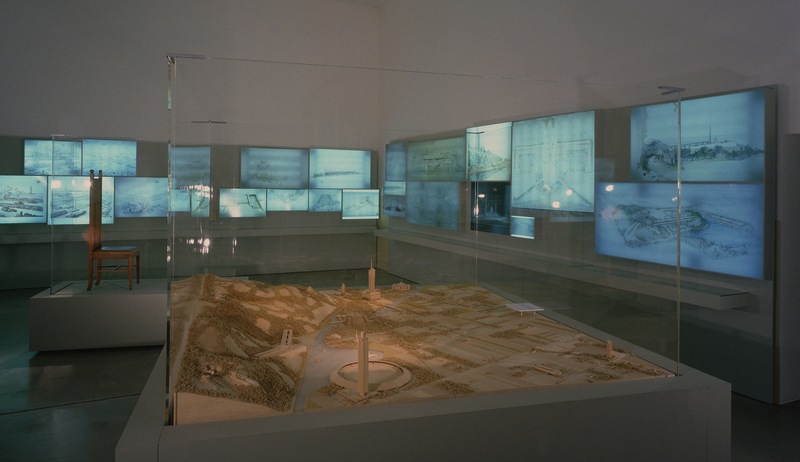 The Living City three-dimensional hypothetical model, completed in 1997, has traveled around the world for the past twenty-years introducing museum visitors to Frank Lloyd Wright’s utopian vision, in shows such as Frank Lloyd Wright And The Living City, organized by Vitra Design Museum,Weil am Rhein, and exhibited by VGrassimuseum, Leipzig; Vitra Design Museum, Berlin; Kelvingrove Art Gallery and Museum, Glasgow, Scotland; Beurs Van Berlage, Amsterdam; Museum für Kunst und Kulturgeschichte, Dortmund; Institut Valencia d’Art Modern, Valencia; Fundación Pedro Barrié de la Maza, Conde de Fenosa, La Coruña; Municipal House, Prague; Centro Cultural de Belem, Lisbon, Portugal; MARCO, Museo de Arte Moderno, Mexico City; Museo de Arte Contemporaneo, Monterrey; Centro de Exposiciones de Benalmadena, Benalmádena; and Antiguo Convento de Santa Maria de los Reyes, Sevilla. The Living City has also been included in Frank Lloyd Wright: From Within Outward, celebrating the fiftieth anniversary of Wright’s Solomon R. Guggenheim Museum in NYC , and also Guggenheim Bilbo, and Frank Lloyd Wright: Organic Architecture for the 21st Century, shown at Milwaukee Art Museum and Phoenix Museum of Art, on the occasion of the 100th anniversary of Taliesin – Wright’s home, studio, and school in Spring Green, Wisconsin. 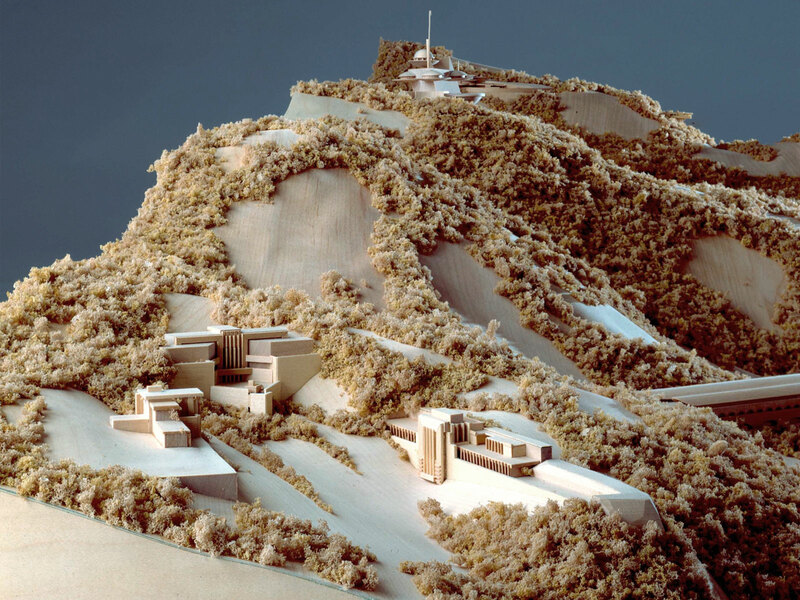 Recently, The Living City model represented the thesis of Frank Lloyd Wright’s decentralized, sustainable city in La Città Nuova: Oltre Sant’Elia. Cento anni di visioni urbane, 1913-2013, at Villa Olmo & Civic Art Gallery, Como, Italy. 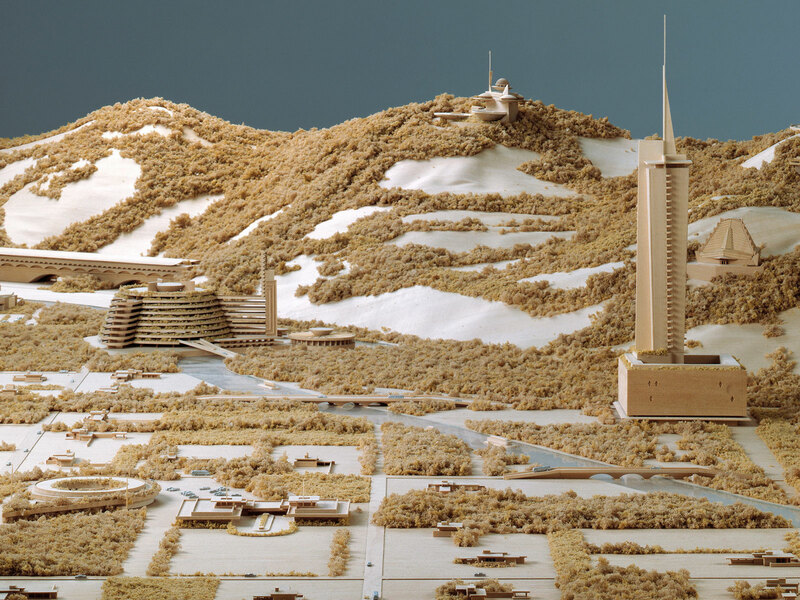 The Living City model has been featured in numerous publications, beginning in the Spring 1998 issue of Quarterly – a publication of the Frank Lloyd Wright Foundation. REVIEW: “Frank Lloyd Wright: Organic Architecture for the 21st Century,” Milwaukee Art Museum, 2011. “Milwaukee Art Museum looks at Frank Lloyd Wright architecture,” The Associated Press, March 26, 2011. “Frank Lloyd Wright. The living city.” Convent of Santa María de los Reyes, Sevilla. Jun 10 – Nov. 30, 2003. “Frank Lloyd Wright.” IVAM INSTITUTO VALENCIANO DE ARTE MODERNO, VALENCIA. July 20 – Sept. 24, 2000. “Fair exhibits Frank Lloyd Wright and the Living City.” Beurs of Berlage in Amsterdam. February 23, 1999. “Frank Lloyd Wright and the Living City.” Art Gallery and Museum, Kelvingrove, Glasgow. The Guardian, February 20, 1999.